Heat your non-dairy milk in a saucepan until hot but not boiling. Remove from heat and pour over the dandelion root tea bag in a mug or glass measuring cup. Let the tea steep and set aside to cool. Preheat the oven to 350°F. 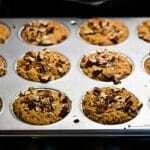 Grease a muffin tin liberally with coconut oil, or alternatively line with muffin cups. In a medium bowl, combine the almond flour, coconut flour, baking soda, baking powder, cinnamon, and salt. Stir until evenly mixed. When it has cooled enough to handle, remove the tea bag from the non-dairy milk and squeeze it to get as much of dandelion root tea out as possible. Then measure out 1/2 cup of the dandelion root tea infused milk. In a large bowl, combine the softened coconut oil and coconut sugar and mix until combined. Add the eggs and 1/2 cup of dandelion root tea infused milk and stir until smooth. 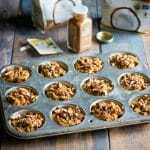 Fill each muffin cup to nearly full, then top each one with about one tablespoon of chopped walnuts. Bake for 20-25 minutes or until a toothpick inserted in the center of a muffin comes out clean and the walnuts are slightly toasted and fragrant. Let the muffins cool in the pan for at least 10 minutes before carefully removing. These dandelion root muffins are so good, I know that you will love them! Get all the benefits of dandelion root, but in a tasty muffin form. They are delicious served next to a hot mug of roasted dandelion root tea! Recipe Credit: Grow Forage Cook Ferment.